Posted June 14, 2009 by Norburn Lighting and Bath Centre & filed under Bathroom Sinks, Kitchen & Bath Plumbing, New Products, Trends . The Antilia basin would work wonderfully in a contemporary setting. Its solid, simple style curiously juxtaposes with its material: delicate glass. The feel of the Antilia basin likewise presents a paradox â€“ the strong presence of its form dominates and demands attention, yet the sink would blend well into any existing modern decor. 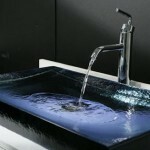 The unobtrusive design and muted color of this decorated basin means that although it is bold, it need not take over. 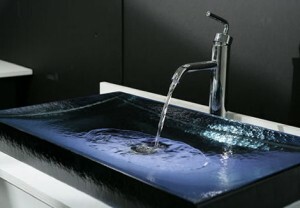 The textured surface adds interest and a tactile aspect to the basinâ€¦ it beckons to be touched.